In 1972 Leonard Cohen toured Europe and Tony Palmer’s newly restored film Bird On A Wire documents not just the tour but the time and the artist as he was on the road to finding himself. It’s a fascinating look into one of the foremost writers of our time at a point where his voice had come of age yet his confidence had not. The original film was thought to be lost for years until 2009 when most of the original rushes were found in rusted cans and restored. Palmer who is known for directing rock films such as: Cream’s Farewell Concert, Zappa’s 200 Motel, and All My Loving which features Jimi Hendrix and The Beatles among others, followed Cohen backstage in addition to capturing some wonderful performances. 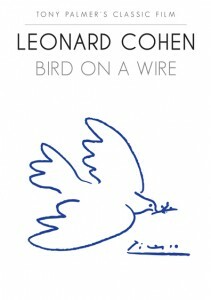 Aside from some classic live renditions of songs like: “Suzanne,” “So Long Marianne,” “Chelsea Hotel,” and of course “Bird On A Wire” the film shows some remarkable interactions with the crowd as Leonard improvises tunes onstage, talks to audience members, and at one point, cuts the show short leaving the stage in tears. It’s a tremendously revealing look at Cohen who was at one of the heights of his career and even though Cohen spent two extra years re-editing the film with Palmer leading to its original late release date in theaters in 1974, many private moments remain such as Leonard picking up girls backstage, dropping acid before the show, and fighting with management and security at shows. The DVD which runs 106 minutes comes with a reproduction of the original poster as well as some artwork, making this a must have for any Leonard Cohen fan, while also serving as an interesting document of the attitude of the time as well.